Successfully Added Car Air Ionizer - Ozone-Free Car Plug-In Ionizer to your Shopping Cart. Compact sized car air ionizer for direct plug-in to your car cigarette lighter. 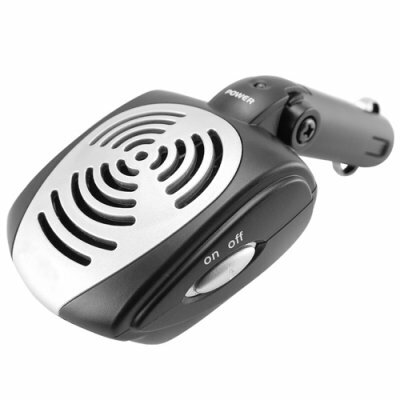 Reduce exhaust fumes, cigarette smoke and other similar pollutants that linger within your vehicle with this little beauty. This car ionizer purifies the air within your vehicle by emitting negatively charged ions which attract pollutants and then effectively cling to them so that they become heavy and harmlessly fall to the ground. This is all done without the need for an air filter, making it a convenient and cost effective way to clean the air inside your car / van / SUV. By making the air in your car fresh you can better enjoy your long commute while not having to worry about how bad the air quality outside is these days. Simply plug in the air ionizer into your cigarette lighter adapter, adjust the angle and switch it on, that's all the effort it takes to give you and your family fresher air for the road ahead! A great wholesale price makes this product perfect for the resale market, OEM market, or personal/company use. As always, it is available direct to you from the original source for wholesale direct from China electronics, Chinavasion.